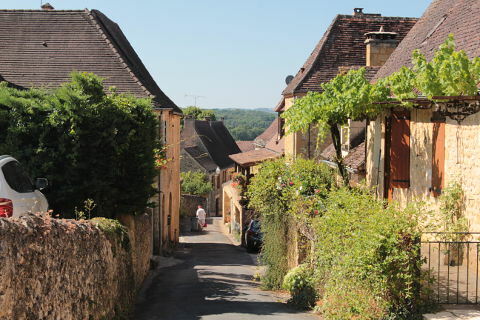 Domme is classified as one of the most beautiful villages of France and occupies a splendid position high above the Dordogne river. 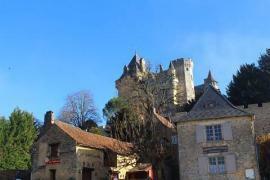 The village is lovely and the views are a bonus as is the cave system that sits right underneath the main square. 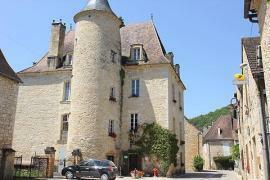 The tourist office of Domme can be found on the main square - the Place de la Halle. Pick up the map and you will ensure you see all the main sights. 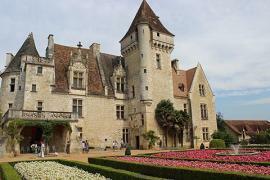 The tourist office and Mairie are located in the very impressive Maison du Gouverneur on the Place de la Halle. 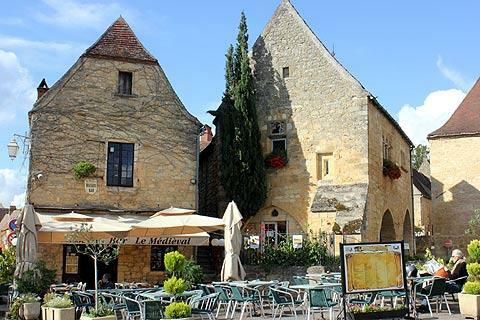 This is the main part of the town and as well as admiring the beautiful 13th century buildings (the bastide was founded in 1281 by Philip the Bold) you can find the entrance to the Grottes de Domme. 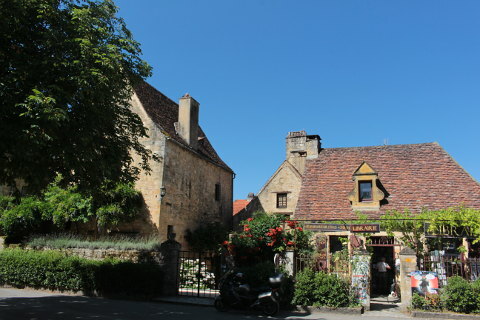 From the main square, the Place de la Halle, wander down the adjacent streets. 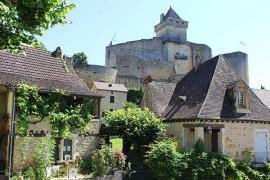 All of them reveal interesting architecture ranging from colombage (half-timber) buildings, to steep perigordine roofs, to small turrets and also some of them lead to the different stone gateways in the walls surrounding Domme. Domme has a little tourist 'train', the Domme Express which is very popular with children. 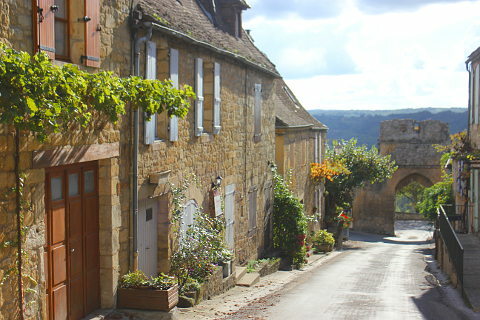 Despite large numbers of tourists Domme is one of our absolute favourite Dordogne towns (even if you do have to pay to park, even in the middle of winter!). The Grotte de Domme entrance is under the halle in the main square. The huge caves exist under the whole town and during the visit you can see beautiful stalactite and stalagmite formations. 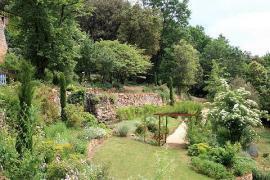 They are the biggest caves in the Perigord Noir area. 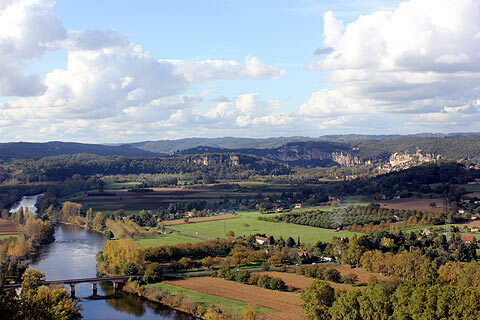 At the end of the visit a lift takes you to a panoramic viewpoint overlooking the Dordogne valley. Le Petit Train - Domme has a little tourist train which travels around the key points of interest in the town. The trip is accompanied by an audio-commentary. Le Petit Train runs from the 1st April to the 31st October. 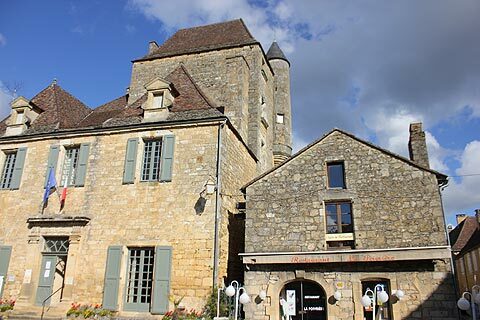 L'Oustal du Perigord is a museum housed in one of the lovely buildings on the main square. 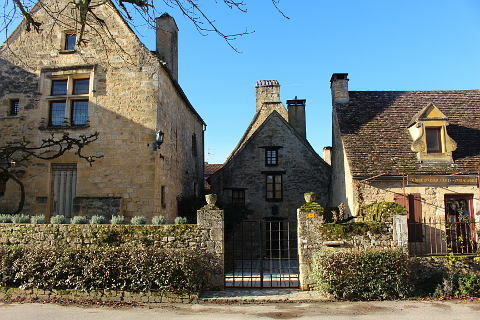 Inside the museum are lots of items relating to life in the Perigord during the last century. One of the best days to visit Domme is on Thursday which is market day. 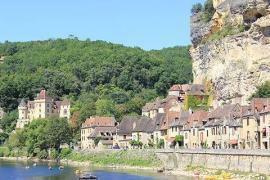 Domme is situated in one of the most beautiful parts of the Dordogne and is close to other most beautiful villages such as La Roque Gageac and Beynac as well as the fabulous town of Sarlat on the other side of the river - indeed you can see La Roque Gageac from the Belvedere de la Barre in Domme. 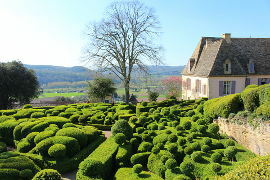 There are also gardens including the wonderful Jardins de Marquayssac, and the splendid castles of Castelnaud, Beynac and the Chateau des Milandes as well as much much more - see the map below.